Atec employs qualified buyers experienced in the purchasing and expediting of a broad range of materials, components, and services. From electronics to heavy fabrication, Atec’s purchasing agents utilize an active supplier management and inspection program to ensure the performance of suppliers to AS9100C and ISO9001 standards. We put a premium on long-term relationships by vetting all of our suppliers with site surveys, inspections, and established benchmarks through our Supplier Management Program. When an important item is being manufactured or treated out of our plant, we will send a qualified inspector whenever complexity or non-familiarity issues dictate. We provide efficient and reliable, high-quality assemblies and products to clients that can benefit by applying their precious resources elsewhere in their projects. Allocating our logistical, project management and admin capabilities to their projects at small company costs, provides a significant financial advantage to our customers, over handling non-core tasks in-house. Outsourcing non-core workload and integrating internally and externally sourced materials is fundamental to the success of Atec products. We rigorously maintain the integrity, quality, and value of every product we deliver and every service we offer. Even when purchased from Celtech, Vital Link, and Hager, plant processes are reviewed, and procured items are inspected at receiving and tested upon integration into the final product. Both in-plant oversight and supplier processes are two major aspects of our quality planning that contribute to the consistently exemplary products and services that form the foundation of our reputation in industry. For many companies, focusing on smaller, non-core tasks can derail scheduling and compromise the quality of the overall operation. Because Atec has the infrastructure of a Prime Contractor coupled with the flexibility and responsiveness of a small company, our Project Engineers, machinists, assemblers, materials handlers, Quality inspectors, and support staff are able to complete legacy tasks with the high enthusiasm to meet deadlines and ensure attention to detail. A manufacturing project’s final success hinges on the skilled and meticulous integration of the components delivered. Whether Atec is tasked with designing, manufacturing build-to-print materials, or continuing to maintain and support legacy products, we combine process adherence with the capable commitment of our people to guarantee the ultimate triumph of a project. Our staff of over 100 engineers, combined with our in plant precision Machine Shop and electro-mechanical Assembly Floor, provides a start-to-finish solution for a wide range of projects coordinated under our Supplier Management Program. Atec is a system integration specialist. We integrate new systems, as well as replace unreliable components in existing facilities. 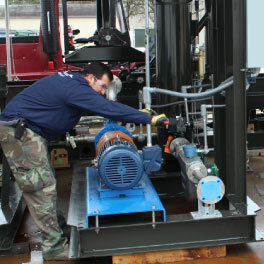 Atec brings components into skids and packaged products, and such packages into full systems or facilities. Updating legacy systems enhances performance and improves the efficiency of existing facilities. We provide total integration, including electrical and piping networks, facility layout, and storage and transportation issues, while maintaining compatibility between new and existing systems. Fitting modern gear into legacy systems and installations is an Atec strength.